Mouse monoclonal LXR alpha antibody [PPZ0412]. Validated in WB, IP, ELISA, IHC, Flow Cyt, ChIP, ICC/IF and tested in Mouse, Rat, Human. Cited in 38 publication(s). Independently reviewed in 11 review(s). E.coli-expressed recombinant fragment, corresponding to amino acids 164-447 of Human LXR alpha. Rat hepatocyte and kupffer cell. Rat spleen macrophage. This product was changed from ascites to tissue culture supernatant on 3rd April 2019. Please note that the dilutions may need to be adjusted accordingly. If you have any questions, please do not hesitate to contact our scientific support team. Our Abpromise guarantee covers the use of ab41902 in the following tested applications. WB Use at an assay dependent concentration. Predicted molecular weight: 50 kDa. ChIP - Anti-LXR alpha antibody [PPZ0412] - ChIP Grade (ab41902)This image is courtesy of an anonymous abreview. Cross-linking (X-ChIP) analysis of RAW 264.7 murine macrophage cell line nuclear cell lysate labeling LXR alpha with ab41902. 10 minutes duration of cross-linking using formaldehyde as cross-linking agent. Postive control: DMSO treated cells and T091317 treated cells (RAW overexpressing human LXRalpha); nehative control: DMSO treated cells and T091317 treated cells (RAW without overexpression of human LXRalpha, RAW VO). Samples were immunoprecipitated with mouse IgG. Immunohistochemistry (Formalin/PFA-fixed paraffin-embedded sections) - Anti-LXR alpha antibody [PPZ0412] - ChIP Grade (ab41902)This image is courtesy of an abreview submitted by Rudolf Jung, University of Regensburg. Immunohistochemistry (Formalin/PFA-fixed paraffin-embedded sections) analysis of human spleen tissue sections labeling LXR alpha with ab41902 at 1/100 dilution. Tissue was fixed with formaldehyde and permeabilized with Tween 20. Heat mediated antigen retrieval was performed using TRIS-EDTA Buffer. Tissue sections were incubated with Anti-LXR alpha antibody [PPZ0412] - ChIP Grade (ab41902) for 30 minutes at 20°C in diluent from DAKO. An undiluted HRP conjugated horse anti-mouse secondary antibody was used. 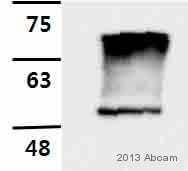 Western blot - Anti-LXR alpha antibody [PPZ0412] - ChIP Grade (ab41902)This image is courtesy of an anonymous abreview. ab41902 staining LXR alpha in rat spleen macrophage cell paraffin section (20-40ug/mL) by Immunohistochemistry, formalin-fixed paraffin embedded sections. Immunocytochemistry/ Immunofluorescence - Anti-LXR alpha antibody [PPZ0412] - ChIP Grade (ab41902)This image is courtesy of an abreview submitted by Dr Elizabeth Kilby. Immunocytochemistry/ Immunofluorescence analysis of human THP1 monocyte-derived macrophages labeling LXR alpha with ab41902 at 1/50. Cells were fixed with paraformaldehyde and permeabilized with 0.25% Triton X-100 in PBS. Next the cells were blocked with 10% BSA for 30 minutes at room temperature, followed by incubation with primary antibody in 10% BSA/0.05% Triton/0.3M glycine in PBS for 16 hours at 4°C. 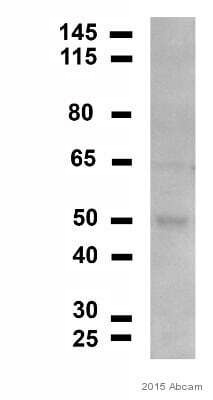 A polyclonal donkey anti-mouse Alexa Fluor® 555 secondary antibody was used at 1/300 dilution. DAPI nuclear counter stain. ab41902 staining LXR alpha in Rat Hepatocyte and Kupffer cell paraffin section (20-40ug/mL) by Immunohistochemistry, formalin-fixed paraffin embedded sections. Overlay histogram showing HepG2 cells stained with ab41902 (red line). The cells were fixed with 80% methanol (5 min) and then permeabilized with 0.1% PBS-Tween for 20 min. The cells were then incubated in 1x PBS / 10% normal goat serum / 0.3M glycine to block non-specific protein-protein interactions followed by the antibody (ab41902, 1µg/1x106 cells) for 30 min at 22ºC. The secondary antibody used was DyLight® 488 goat anti-mouse IgG (H+L) (ab96879) at 1/500 dilution for 30 min at 22ºC. Isotype control antibody (black line) was mouse IgG2a [ICIGG2A] (ab91361, 2µg/1x106 cells) used under the same conditions. Acquisition of >5,000 events was performed. Publishing research using ab41902? Please let us know so that we can cite the reference in this datasheet. Thank you for your offer to replace the antibody. I would prefer to take ab106464 as it has been tested with rat liver lysate.It will be extremely helpful if you can send it along with your next shipment to the distributor. I'm almost on the verge of winding up my work, so kindly help me with a speedy supply. As requested, one unit of ab106464 has been added to the next order to be shipped to our distributor. I wish all the best with your reseach work. Inquiry: I had purchased one vial of ab41902, LXR alpha antibodylot no: GR9889-6 I performed a western blot with rat liver lysate(nuclear lysate). Homogenising buffer: Buffer A: 10mM HEPES, 1.5mM MgCl2, 10mM KCl, 0.05%NP40, with protease inhibitors. Homogenate was centrifuged at 800G for 10 min. Nuclear pellet was washed in same buffer and then suspended in RIPA buffer with protease inhibitors. Homogenate was briefly sonicated for 3 pulses of 5 sec each. Centrifuged at 24,000 G for 20 min. Supernatant was used as the nuclear fraction. Running conditions: 10% SDS-PAGE with 4% stacking. 100V for 20 min, 200V for 40 min. Blocking: 5% milk in TBST(0.1%)- 1hr at RT. Primary antibody: 1:1000 in 2.5% BSA TBST(0.1%)-16 hrs at 4°C. Secondary antibody: 1:1000 anti mouse IgG in 5% milk in TBST(0.1%)- 1 hr at RT. Wash with TBST(0.1%)- 3X 5 min Developed using ECL West pico chemiluminescent substrate. Exposure time: 15 sec Observed bands: Prominent double bands at 42 and 52 KDa. The predicted molecular weight is around 50KDa. Does this antibody cross react with LXR beta as well?. Which among the 2 doublet bands is LXR? The details provided will enable us to investigate this case and will provide us with vital information for monitoring product quality. I appreciate the time you have spent in the laboratory and understand your concerns. It is regrettable the results have not been successful. ab41902 is specific to LXR alpha and should not cross-react with LXR beta. Having reviewed the protocol details, I believe this product should have given satisfactory results. It appears that you may have received a faulty vial. I apologize for the inconvenience and am pleased to offer you in compensation a credit note, or a refund or a free of charge replacement with an alternative anti-LXR alpha such as ab3585 (www.abcam.com/ab3585) or ab106464 (www.abcam.com/ab106464). Customer kindly called as they were experiencing high non specific background in western blot on Bone Marrow-Derivated Macrophage samples. I have been in contact with the lab on your behalf requesting the blocking peptide for ab41902. Unfortunately this is not available. I am very sorry for any inconvenience and will continue to work with you to get the best results possible with this product. Please do not hesitate to contact us if you need any more advice or information. How was the antibody validated ? Can they get a protocol or images (eg. WB image)about this process?